Ever tried sour beer with pizza? 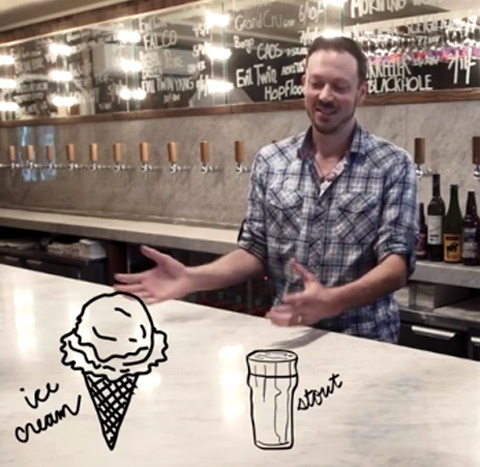 How about ice cream with Russian imperial stout? The guys behind Tørst break down their favorite pairings. Tørst is a beer bar in Greenpoint, Brooklyn that boasts 21 rotating taps and a mind-boggling stash of 150 bottles in its cellar downstairs. Hiding out in the back of the bar is a tasting menu restaurant called Luksus. So, it makes sense that Torst beer consultant Brendan Woodcock and Luksus chef Daniel Burns know a thing or two about pairing beer and food. Burns goes through a couple tried-and-true pairings in the WNYC video above, but we thought we’d make it even easier and break them down for you below. You know, so you can go grab a scoop of vanilla ice cream and a bottle of Russian imperial stout for breakfast. Cheers!